Dr. Tamm is an Associate Professor, Dr. Balachandran is an Assistant Professor, Dr. Bhosale is an Assistant Professor, and Dr. Marcal is an Assistant Professor, Department of Diagnostic Radiology, The University of Texas M.D. Anderson Cancer Center, Houston, TX. Nevertheless, advances have been made in many areas, including surgery, chemotherapy, and radiation therapy. Protocols that include preoperative chemotherapy and radiation therapy place additional demands on radiologists to precisely describe the extent of disease. 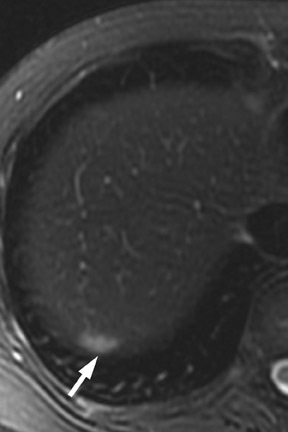 Thin-section imaging with multidetector computed tomography (MDCT), and advances in magnetic resonance imaging (MRI), including multichannel coils, parallel imaging, and liver-specific contrast agents, have improved radiologists' ability to resolve tumor, its relationship to adjacent vessels, and detection of metastases. Close attention to procedural technique is required to obtain optimal results. Advances in postprocessing provide new perspectives to evaluate the extent of local disease spread. Proper integration of endoscopic ultrasound (EUS) into clinical algorithms for the detection of pancreatic neoplasm can result in significant improvement in the ability to detect small tumors. Unfortunately, signs and symptoms of pancreatic cancer are nonspecific, which results in most patients presenting with advanced disease. Typical symptoms include weight loss, malaise, and abdominal pain. Jaundice is seen secondary to biliary obstruction from pancreatic head tumors. Cancer antigen (CA)-19-9, the most commonly utilized serum marker, can be elevated in a variety of benign conditions (pancreatitis, biliary obstruction, cholangitis, hepatitis, etc.) as well as in other malignancies (gastric, biliary, and colonic). Given its limited sensitivity and specificity, it has not emerged as a useful screening tool. 6,7 Other serum markers are being studied but remain in the investigational stage. When patients present with the above findings, transabdominal ultrasound is often used for the initial work-up. Transabdominal ultrasound can identify whether there is biliary obstruction, the level of obstruction, and if there is concurrent gallbladder pathology (gallstones, cholecystitis, etc). 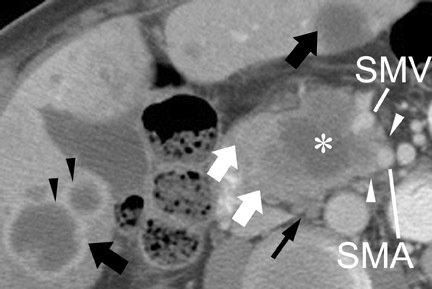 Traditionally, if common bile duct obstruction were present, patients would undergo endoscopic retrograde cholangiopancreatography (ERCP) for the identification of impacted stones and their removal, identification of strictures, acquisition of brushings for pathologic examination, and stent placement to treat obstruction. Subsequently, patients had cross-sectional imaging to work-up suspected malignancies, followed by biopsy, if appropriate, to confirm the tumor diagnosis. The use of ERCP following ultrasound, while treating biliary obstruction early, can result in significant postin&#64258;ammatory changes that can impede the accuracy of diagnosis and staging on cross-sectional images. 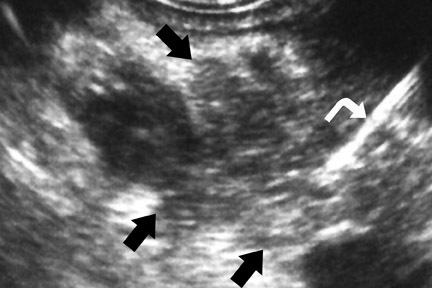 Additionally, the presence of a biliary stent eliminates visualization of the transition point of obstruction in the common bile duct, a valuable diagnostic sign for CT, MRI, and EUS, which has been shown to decrease the negative predictive value of EUS with fine needle aspiration (FNA). 8 For this reason, it is probably best that patients with suspected pancreatic cancer undergo cross-sectional imaging prior to intervention. At the authors' institution, following cross-sectional imaging, patients undergo EUS to guide biopsy and confirm the diagnosis prior to initiating our routine protocol of preoperative chemotherapy and radiation therapy for resectable tumors. Endoscopic retrograde cholangiopancreatography is then performed immediately after EUS and typically at the same setting as EUS. In most institutions, CT is the primary cross-sectional modality for the work-up of suspected pancreatic cancer. Recent developments in multidetector CT allow for imaging of the abdomen in ≤5 seconds at less than 0.6 to 0.7-mm slice thickness. These developing capabilities decrease volume-averaging artifacts that can obscure small pancreatic cancers that are typically poorly distinguished from normal surrounding pancreatic parenchyma (Figure 1). Close attention to technique is very important to maximize the visualization of small, potentially curable pancreatic tumors. A study by Ariyama et al 9 reported nearly 100% 5-year survival for patients with pancreatic tumors <1 cm in the absence of spread beyond the pancreas. Rapid intravenous contrast administration (4 to 8 mL/sec) of 120 to 150 mL of iodinated contrast has been shown to increase tumor conspicuity by increasing peak pancreatic enhancement and thereby increasing the contrast between normal pancreas and tumor. 10,11 Dual-phase imaging of the entire abdomen during the phase of peak pancreatic parenchymal enhancement and during peak portal venous enhancement optimizes the detection of the primary pancreatic tumor, the visualization of arterial and venous structures required for staging, and the identification of liver metastases. 11-13 Bolus tracking techniques help control for circulation time variation. The authors' dual-phase protocol for imaging on a 64-detector-row scanner (LightSpeed 64, GE Healthcare, Waukesha, WI) utilizes a pitch of 0.938, tablespeed of 39.37 mm/sec, and slice thickness of 2.5 mm at 140 kV, resulting in a 5-second image acquisition for the entire ab do men. Images are then reconstructed for both phases to 0.625 mm for problem solving and, if needed, multiplanar and 3-dimensional (3D) reconstructions. We prefer an injection of 5 mL/sec for 150 seconds for a 30-second duration. Measuring the aortic enhancement at the level of the celiac origin, we use a trigger value of 100 HU (in our experience, approximately 20 seconds postinjection), and a diagnostic delay of 20 seconds. The scan is initiated at the level of the diaphragm at 40 seconds postinjection (in a normal individual) completing the abdominal study within 5 seconds. After another 15-second delay, the abdomen is imaged again in the portal-venous phase. Most tumors appear as a poorly defined hypodense mass in the pancreatic parenchymal phase (Figure 1) with a significant percentage becoming isodense to normal pancreas on later phases. 12 For this reason, close attention must be paid to all phases of enhancement, with particular attention paid to the pancreatic parenchymal phase. 13,14 The detection rate for tumors of any size ranges from 86% to 97%, but in our experience the detection rate for small tumors of <2 cm is approximately 77% to 83%. 8,15 For this reason, close attention must be given to subtle secondary abnormalities. These include, but are not limited to, focal pancreatic enlargement, distortion of the pancreatic contour, regional pancreatic atrophy, and regional adenopathy or soft tissue changes near vessels. The most important abnormalities are likely obstruction of the common bile duct and/or the pancreatic duct. 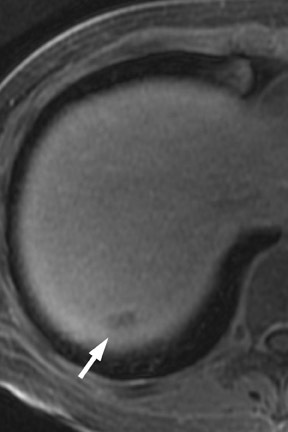 Gangi et al 16 showed that duct dilatation and cutoff were seen 2 to 18 months prior to a clinical diagnosis in up to 50% of patients who had imaging prior to establishing a diagnosis. This finding is especially critical for small tumors. Ishikawa 17 et al showed that for tumors <1 cm, 57% showed duct dilatation while an actual mass could be detected in only 26%. The differential diagnosis for pancreatic adenocarcinoma most commonly includes chronic pancreatitis, lympho ma, and metastatic disease (Figure 2). 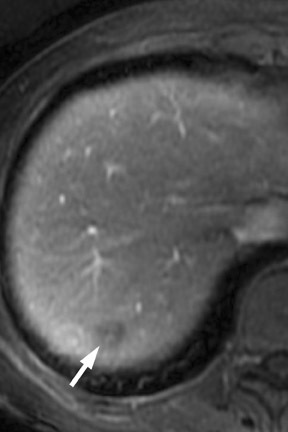 Multiple advancements have been recently made in MRI, including multichannel coils, parallel imaging, and 3D volume acquisition techniques that allow thin-section imaging to be acquired with minimal noise and good contrast while maintaining higher resolution than in the recent past. Developments on the 3T platform promise even better signal-to-noise ratio. Our protocol includes T1-weighted breath-hold gradient-recalled echo (GRE) imaging with parallel imaging, fat-suppressed fast spin-echo (FSE) respiratory-triggered or fast-recovery breath-hold, and 3D gradient-recalled fat-suppressed dynamic (20, 60, and 120 seconds after contrast injection) imaging of the abdomen (Figure 3). We also acquire postcontrast 4-mm contiguous axial fat-suppressed fast imaging employing steady-state acquisition (FIESTA) (GE Healthcare, Waukesha, WI) images for local staging. Fat-suppressed FIESTA images, similar to true fast imaging with steady-state precession (trueFISP) on other platforms, are relatively insensitive to motion, show vessels as bright and soft tissues as intermediate signal, and provide high in-plane resolution (Figure 4). Because this is a T2-weighted (T2W) image, in our opinion, comparison with other sequences is useful to avoid potentially overestimating vascular involvement. Thin-section 3D fast recovery, fast spin-echo (FRFSE) long echo time (TE), fat-suppressed coronal images can be acquired as an abbreviated MR cholangiopancreatography (MRCP) to improve the detection of ductal abnormalities and to determine if lesions communicate with the pancreatic duct (such as intraductal papillary mucinous neoplasms and pseudocysts). We inject contrast at approximately 3 mL/sec with a duration of approximately 5 to 10 seconds for most single-dose contrast injections, depending on the patient's body weight. Given a typical cardiac circulation time, the peak pancreatic parenchymal phase begins approximately 20 seconds after the start of the contrast injection. 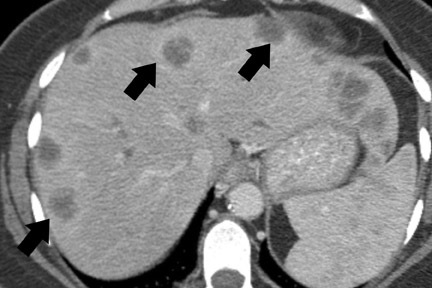 The appearance of pancreatic tumors on dynamic MRI parallels that on contrast-enhanced CT. Tumors are typically hypointense on the initial phase of imaging (20 to 40 seconds after contrast injection) and, as on CT, many become isointense to normal pancreas on later phases of imaging (Figures 3 and 4). 18,19 It is often difficult to differentiate primary tumor from normal pancreas on T2W images, but duct dilatation is typically well seen on this sequence and on dynamic contrast-enhanced images. As with CT, it is important to carefully look for secondary signs that may suggest the presence of tumor. MR cholangiopancreatography alone has been described as having a specificity of 97% and a sensitivity of 84% for tumor. 20 The differential for pancreatic tumors on MRI is the same as that for CT.
Endoscopic ultrasound, with a reported sensitivity of 91% to 100%, is currently probably the most sensitive technique for the identification of pancreatic tumors, but its specificity is limited unless FNA is performed at the same setting. 8,21-24 In a study of 233 patients performed at our institution, EUS-FNA had a specificity of 100%, but the sensitivity was only 91% because of sampling error. 24 We also found that biliary stents significantly diminished the negative predictive value of EUS-FNA. 8 In a study of 133 patients that compared 4-detector-row MDCT with follow-up EUS, we found EUS, with knowledge of CT results, had higher sensitivity than CT, detecting 96% of tumors <2 cm, compared with a sensitivity of 70% to 93% for MDCT. 8 Pancreatic tumors typically have the appearance of a mass of variable hypoechogenicity and poorly defined borders (Figure 5). The differential is the same as that for CT and MRI with chronic pancreatitis potentially mimicking, as on the other 2 modalities, nearly all the findings of pancreatic cancer. 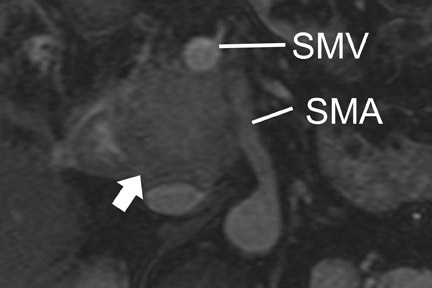 For MRI, a compromise of the fat plane between tumor and vessel, the extent of circumferential involvement of vessel by tumor, and vessel irregularity have all been used to assess vascular involvement (Figure 4). A study using >180˚ of tumor contact with vessels and the effects of tumor on vasculature as the criteria for unresectability showed a similar accuracy of 87% to 90% in identifying unresectable disease for both CT and MRI. The noninvasive assessment of nodal disease by any modality has had only limited success. The typical criterion on CT and MRI has been size. Nodes >1 cm in diameter are typically of concern for metastatic involvement. Unfortunately, reactive lymph nodes, often in the common hepatic and portal venous regions, can frequently measure >1 cm in the short axis, while nodes <<1 cm in the short axis can harbor micrometastatic disease. The identification of suspicious lymph nodes outside the expected surgical field is probably of greater utility. 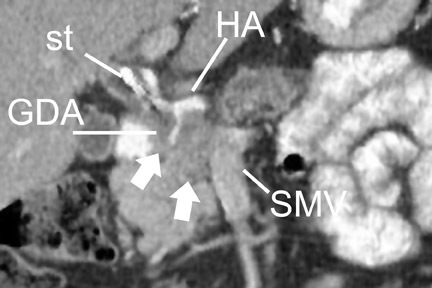 In the case of an anticipated Whipple procedure, these would include retroperitoneal nodes (Figure 7), and nodes to the left of the superior mesenteric artery and vein. Of note is the report from Valls et al 33 that while CT identified only 16.7% (18 of 34) of patients with adenopathy confirmed at surgery, only 5.9% of these patients (2 of 34) were unresectable based solely on adenopathy. 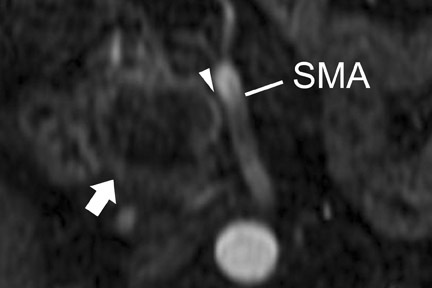 The accuracy of MRI for nodal disease is similar to that of CT, as determination of nodal involvement is typically also made with the same size criteria. Distant spread of pancreatic cancer is most commonly to the liver and peritoneum, with later spread typically to the lungs and bone. The detection of peritoneal metastases from pancreatic cancer is usually very limited because it manifests as low-volume disease. Nevertheless, thin-section imaging, with close attention to common sites of disease and pathways of spread to the peritoneal surfaces (such as the gastrocolic ligament, omentum, gastrocolic trunk, and jejunal mesentery), can improve sensitivity (Figure 10). Close attention to clinical history is necessary. While soft tissue stranding, such as near the anterior abdominal wall, can be a subtle sign of peritoneal disease, postin&#64258;ammatory changes from attempted stent placement or biopsy, surgical assessment (laparoscopy, laparotomy), or recent palliative surgery can confound assessment. In our institution, patients undergo chemotherapy and radiation therapy prior to resection, and such findings can be followed to assess for evolution. Persistent findings that are not clearly peritoneal disease on imaging or are not amenable to percutaneous biopsy in an otherwise resectable patient may result in a laparoscopic assessment for peritoneal disease with conversion to a Whipple procedure if no peritoneal disease is identified. 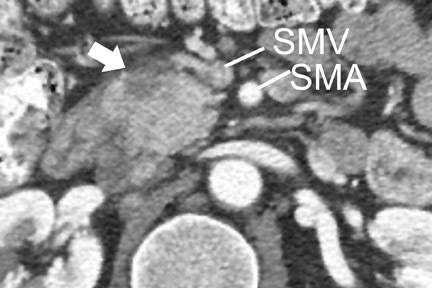 Significant advances have been made in the ability of CT and MRI to visualize pancreatic cancer and to stage disease when close attention is paid to technique and when imaging is obtained prior to any interventions. Integration with other techniques can improve diagnostic accuracy. Jemal A, Thomas A, Murray T,Thun M. Cancer statistics, 2002. CA Cancer J Clin . 2002;52:23-47. Erratum in: CA Cancer J Clin . 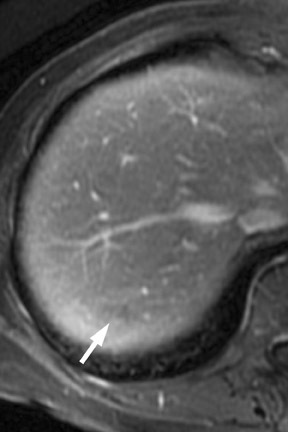 2002;52:119; and CA Cancer J Clin . 2002;52:181-182. Comment in: CA Cancer J Clin . 2002;52:6-7. Douglass HJ, Kim S, Meropol N. Neoplasms of the exocrine pancreas. In: Holland J, Frei EI, Bast RJ, eds. Cancer Medicine . 4th ed. Baltimore, MD: Williams and Wilkins; 1997:1989-2018. Evans DB, Abbruzzese JL, Willett CG. Cancer of the pancreas. In: DeVita VT Jr, Hellman S, Rosenberg SA, eds. Cancer, Principles and Practice of Oncology . 6th ed. Philadelphia, PA:Lippincott Williams & Wilkins; 2001:1126-1161. Lowenfels A, Maisonneuve P, Boyle P. Epidemiology of pancreatic cancer. In: Howard J, Idezuki Y, Ihse I, Prinz R, eds. Surgical Disease of the Pancreas . 3rd ed. Baltimore, MD: Williams& Wilkins; 1998:433-437. Trede M, Schwall G, Saeger HD. Survival after pancreatoduodenectomy. 118 consecutive resections without an operative mortality. Ann Surg . 1990; 211:447-458. Niederau C, Grendell JH. Diagnosis of pancreatic carcinoma. Imaging techniques and tumor markers. Pancreas . 1992;7:66-86. Steinberg W.The clinical utility of the CA 19-9 tumor-associated antigen. Am J Gastroenterol . 1990; 85:350-355. Tamm EP, Loyer EM, Faria SC, et al. Retrospective analysis of dual-phase MDCT and follow-up EUS/EUS-FNA in the diagnosis of pancreatic cancer. Abdom Imaging . 2007;32:660-667. Ariyama J, Suyama M, Satoh K, Sai J. Imaging of small pancreatic ductal adenocarcinoma. Pancreas . 1998;16:396-401. Kim T, Murakami T,Takahashi S, et al. Pancreatic CT imaging: Effects of different injection rates and doses of contrast material. Radiology . 1999; 212:219-225. Schueller G, Schima W, Schueller-Weidekamm C, et al. Multidetector CT of pancreas: Effects of contrast material &#64258;ow rate and individualized scan delay on enhancement ofpancreas and tumor contrast. Radiology . 2006;241:441-448. Lu DS, Vedantham S, Krasny RM, et al. Two-phase helical CT for pancreatic tumors: Pancreatic versus hepatic phase enhancement for tumor, pancreas, and vascular structures. Radiology . 1996; 199:697-701. Ichikawa T, Erturk SM, Sou H, et al. 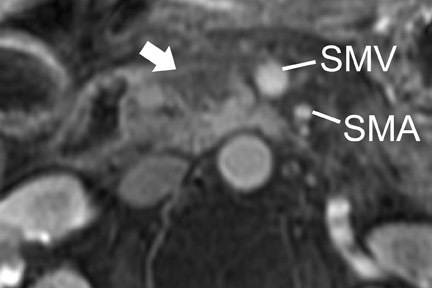 MDCT of pancreatic adenocarcinoma: Optimal imaging phases and multiplanar reformatted imaging. AJR Am J Roentgenol. 2006;187:1513-1520. Bronstein YL, Loyer EM, Kaur H, et al. 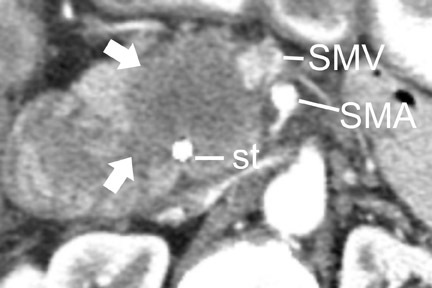 Detection of small pancreatic tumors with multiphasic helical CT. AJR Am J Roentgenol . 2004;182:619-623. Gangi S, Fletcher JG, Nathan MA, et al. Time interval between abnormalities seen on CT and the clinical diagnosis of pancreatic cancer: Retrospective review of CT scans obtainedbefore diagnosis. AJR Am J Roentgenol . 2004;182:897-903. Ishikawa O, Ohigashi H, Imaoka S, et al. Minute carcinoma of the pancreas measuring 1 cm or less in diameter-Collective review of Japanese case reports. Hepatogastroenterology . 1999;46:8-15. Fayad LM, Mitchell DG. Magnetic resonance imaging of pancreatic adenocarcinoma. Int J Gastrointest Cancer . 2001;30(1-2):19-25. Ly JN, Miller FH. 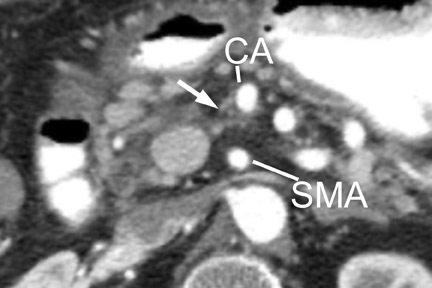 MR imaging of the pancreas: A practical approach. Radiol Clin North Am . 2002; 40:1289-1306. Adamek HE, Albert J, Breer H, et al. Pancreatic cancer detection with magnetic resonance cholangiopancreatography and endoscopic retrograde cholangiopancreatography: Aprospective controlled study. Lancet . 2000;356:190-193. Legmann P, Vignaux O, Dousset B, et al. 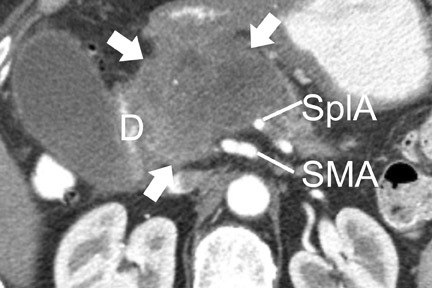 Pancreatic tumors: Comparison of dual-phase helical CT and endoscopic sonography. AJR Am J Roentgenol. 1998;170:1315-1322. Harewood GC, Wiersema MJ. Endosonography-guided fine needle aspiration biopsy in the evaluation of pancreatic masses. Am J Gastroenterol . 2002; 97:1386-1391. Mertz H, Gautam S. The learning curve for EUS-guided FNA of pancreatic cancer. Gastrointest Endosc . 2004 Jan;59(1):33-7. Comment in: Gastrointest Endosc. 2004Jan;59(1):69-73; Gastrointest Endosc . 2004 Jun;59(7):934. Raut CP, Grau AM, Staerkel GA, et al. Diagnostic accuracy of endoscopic ultrasound-guided fine-needle aspiration in patients with presumed pancreatic cancer. J Gastrointest Surg . 2003;7:118-126; discussion 127-128. Tamm E, Charnsangavej C. Pancreatic cancer: Current concepts in imaging for diagnosis and staging. Cancer J . 2001;7:298-311. Greene FL, Page DL, Fleming ID, et al. Exocrine pancreas In: Greene FL, Page DL, Fleming ID, et al, eds. AJCC Cancer Staging Manual. 6th ed. New York, NY: Springer-Verlag;2002:157-164. Sobin L, Wittekind C, eds. Pancreas. In: TNM Classification of Malignant Tumors . 6th ed. Baltimore, MD: Wiley-Liss; 2002:93-96. Lu DS, Reber HA, Krasny RM, et al. Local staging of pancreatic cancer: Criteria for unresectability of major vessels as revealed by pancreatic-phase, thin-section helical CT. AJR Am J Roentgenol . 1997; 168:1439-1443. Loyer EM, David CL, Dubrow RA, et al. 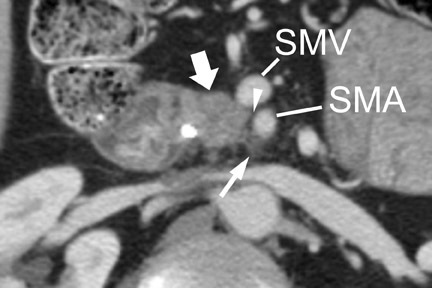 Vascular involvement in pancreatic adenocarcinoma: Re-assessment by thin-section CT. Abdom Imaging . 1996;21:202-206. Li H, Zeng MS, Zhou KR, et al. Pancreatic adenocarcinoma: the different CT criteria for peripancreatic major arterial and venous invasion. J Comput Assist Tomogr. 2005;29:170-175. Hough TJ, Raptopoulos V, Siewert B, Matthews JB. 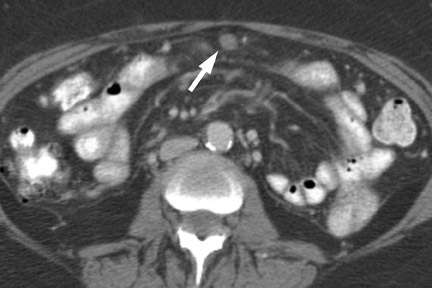 Teardrop superior mesenteric vein: CT sign for unresectable carcinoma of the pancreas. AJR Am J Roentgenol . 1999;173:1509-1512. Comment in: AJR Am J Roentgenol . 2001;176:1600-1601. Tamm EP, Loyer EM, Faria S, et al. Staging of pancreatic cancer with multidetector CT in the setting of preoperative chemoradiation therapy. Abstract. Abdom Imaging . 2006;31:568-574. Valls C, Andia E, Sanchez A, et al. Dual-phase helical CT of pancreatic adenocarcinoma: Assessment of resectability before surgery. AJR Am J Roentgenol . 2002;178:821-826. Balci NC, Semelka RC. Contrast agents for MR imaging of the liver. Radiol Clin North Am . 2005; 43:887-898, viii. Primary pancreatic adenocarcinoma. Appl Radiol.